@Carnbot given @Dchild comment just above your post, perhaps you could illustrate your technique with a couple of screen shots with arrows? I have to admit that the UI is a bit overwhelming in this one so the learning curve is high. No arrows but hopefully this helps, set the beats per orbit at the top, for each of the moons also, after tapping the top events panel. Would be nice to have more than 32 beats. 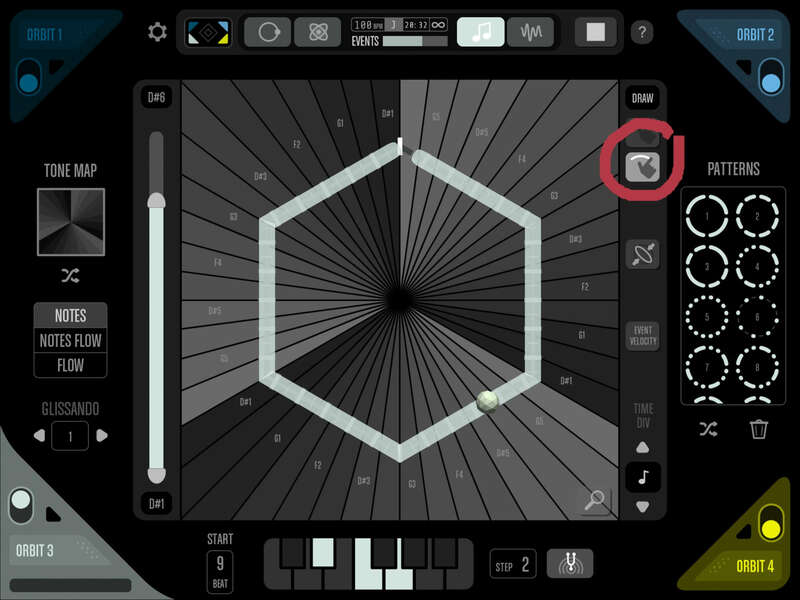 And you can also tap the step 1 at the bottom (highlighted) which allows to add more note changes at different beats. Very helpful; I hadn't seen those options before but they are lots of fun. Thanks, @Carnbot. 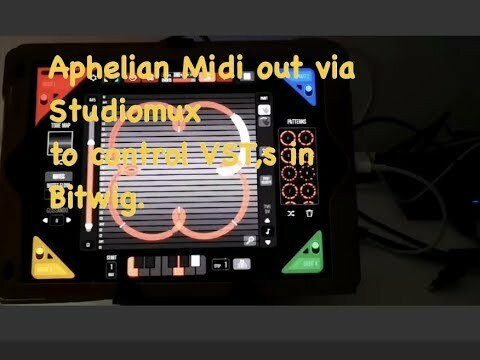 Using Aphelian to sequence VST in Bitwig, via Studiomux as a midi bridge, works a treat! 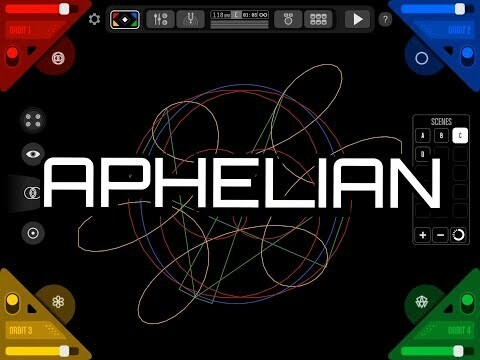 can Aphelian's synths be used as midi instruments via AU or AB3 or IAA? in song mode is there a way to skip to the next scene? You can host Aphelian in AB or AUM etc so yes the synths are available as an IAA instance. In song mode I don’t think so. Got to check. No AUV3... yet. Would be nice. Thought the developers said that is on the list. In song mode (which I have not spent a lot of time in so far) I’m not seeing a way to skip to next scene. Do you mean by MIDI? Not by MIDI, I just meant being able to play the next scene by tapping on its name or something. I was checking out the demo songs and hoped that tapping on scene in the list would play the scene. As far as I can tell, Scene mode is the more “flexible” of the two. You can jump around to whatever scenes you want. The scene can either start instantly or at the end of what is currently playing. I’ve spent most of the time in Scene mode. Have you seen Doug’s video on the Modes? 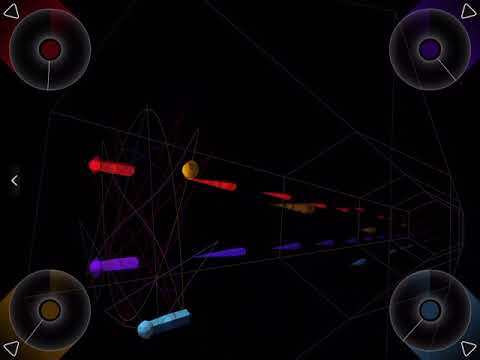 Have orbits on the same gradient and the same trigger pattern. Gradually rotating the whole group and exploring the corners and the sides of the main viewport as the shapes are not limited to being wholly on the board (even though they looked clipped off they still work). I forgot, you can mutate each preset shapes form with a three finger drag. *** Usually I try to keep them paired in some way. Two orbits having the same tone map and the other two having the same but different. 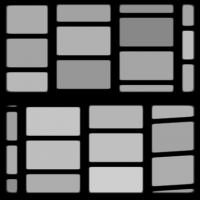 Or by paring up tone maps so that the light dark patterns are inverted. JESUS this thing is Deeeeeeep. You can easily get lost. Did I mention the live playheads that you can scrub like a DJ. But yeah pair it down start simple and add complexity by adding variations. Or just go bleeping hog wild and see what happens. 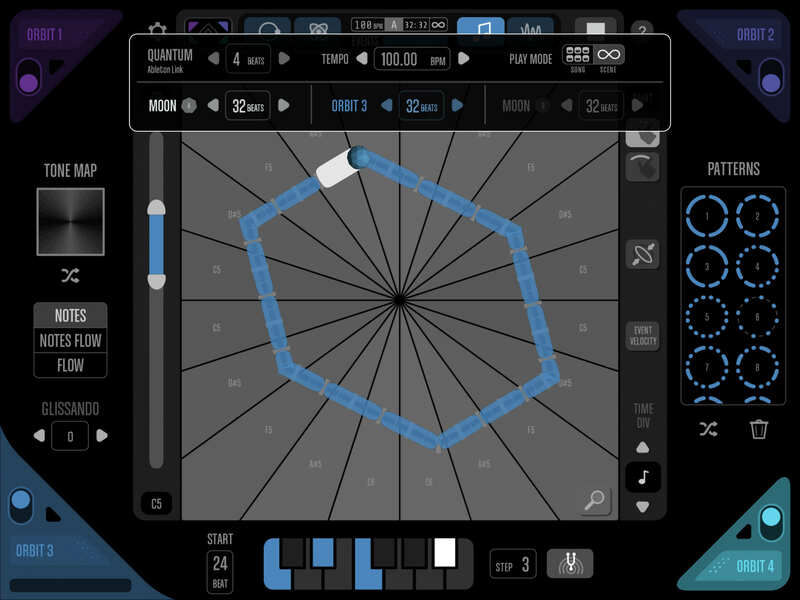 Paint your own by using the tools on the right of the orbit in the notes tab. Visually beautiful app with a great deal of thought put into the design and concept. However, every video I have seen so far sounds like a variation of the same song, same tempo. 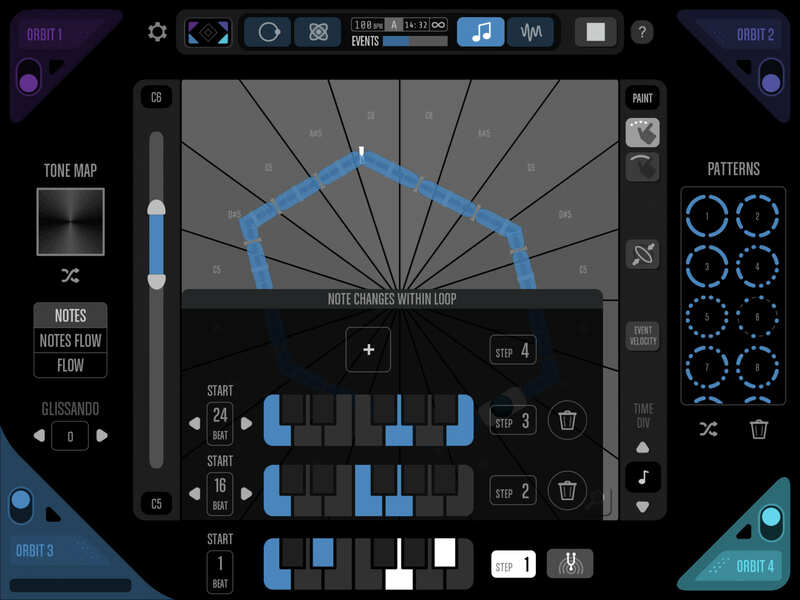 I see people jumping through menus, changing shapes and doing so much but changing so little of the sound or the "type" of music that comes out of this app (at least to my ears!). Everything sounds like a soundtrack to.......ah......Sonic the Hedgehog....!!??. I am hopeful that someone will put out a video that shows something vastly different using the midi out as it seems that there could be a very unique potential in this regard. Despite my criticism I applaud the creators for doing something different and adding to the "fun" factor of ios music making !! Ok here’s a slow jam made with Apheliian for those who just think it does bleepy bloppy high tempo arp type stuff. Nothing special at all - - 1 synth and internal drums to start, then a 2nd synth added, then third, then the fourth and I quickly messed with changing the shape of synth four before taking them all away. Hopefully I shared this link correctly ..
Dope ! And ya I was able to create a lot of slow tempo stuff with it as well, it's more than capable to do arps, leads pads etc at any speed!. I can't figure out how to sustain notes as long as I want tho, they cut off at the markers, any idea how to sustain a note for a whole orbit ? This thread is long and I couldn't find out at first glance, but will this be universal and or auv3? Thanks for the thumbnail manual! Very useful and helpful to have any tips. Aphelian seems intuitive in that one can have instant fun just doodling. And it can get as complex as necessary, short of being a DAW which is not its intent if course. A marvel of design, I think. Another little cool thing is that when you're on the page that has all 4 orbits on it... if you tap and drag each orbit to a corner, it sounds like the sound is coming from that corner. @JuanB What would REALLY be cool is if when you're on the other page where you can manipulate all of the orbits in 3D space... and you rotate the orbit's axis in 3D space, you would hear that same directional spatial effect. And, maybe even record the gestural motions of rotating them in 3D space. You are using CC's on external synths. 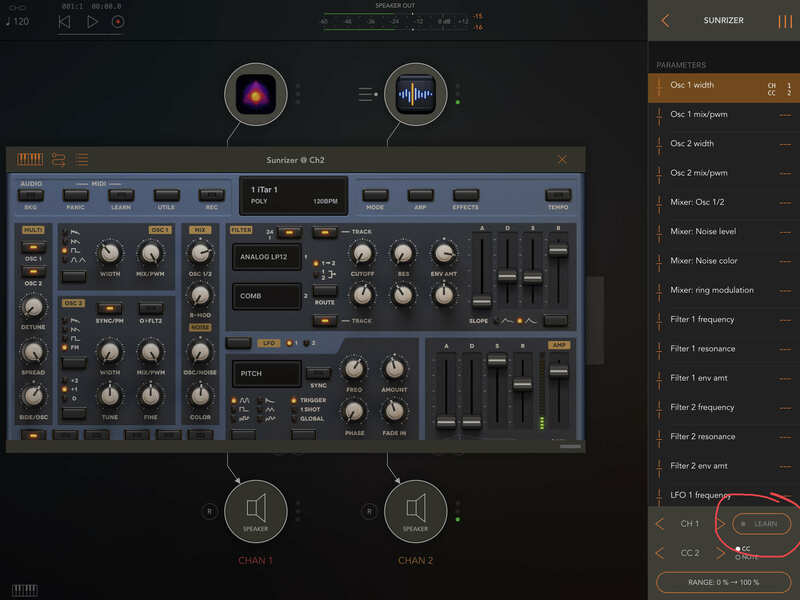 I'm a little daft as to how to patch CC's to synths hosted in AUM or AudioBus. Feel like walking everyone in the class through it? Learned a bunch in just under 10 minutes.. mandatory viewing for all fellow Aphelians. Hopefully more to come..
Ah, tip of the day, you can draw very long notes when you press this icon and draw, carefully, over the divisions in one continual movement. You have to be quite accurate to draw a long note or else you'll need to delete and start again. 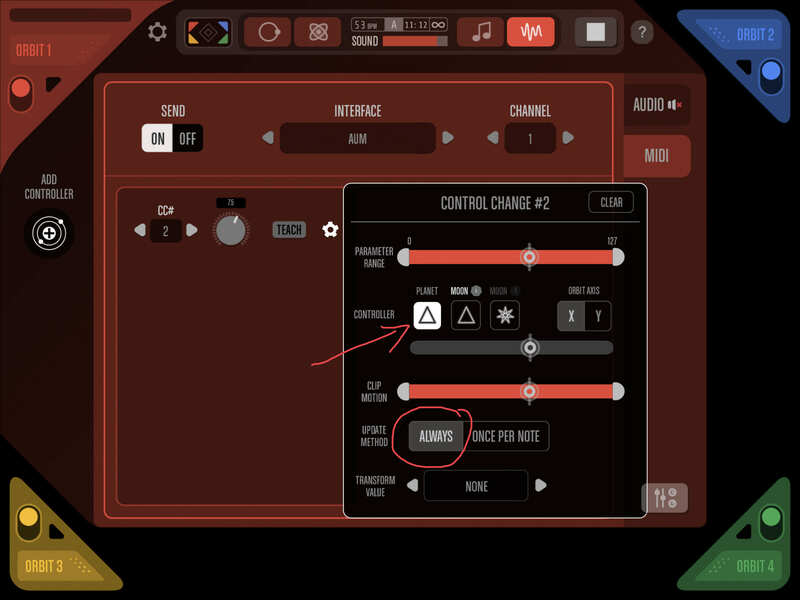 When you are on the Synth page, there is a button on the left, to Add Controller. 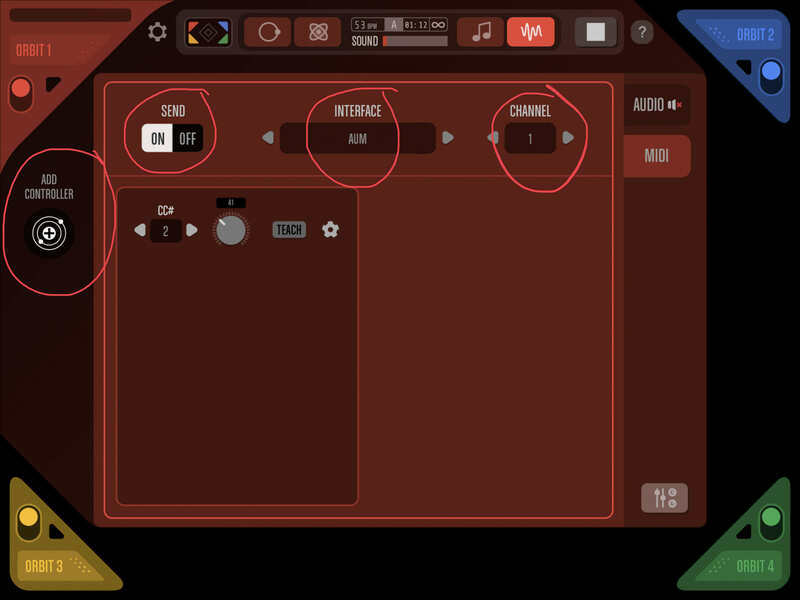 On the audio tab of the synth, it allows you to pick which parameter to control or automate. If you switch to the Midi tab of the Synth page, the Add Controller button adds controllers for Midi Output. You set them up the same way, but can specify midi stuff like CC # as well. The rest is the usual setup method in whatever app/host you are using. Setup midi ports, channels, and CC. Cheers for the great tips @audiblevideo (must have taken a while at least) and for the link @royor. This isn’t important, but I’m curious... in the demo videos the trailing flame/smoke graphics from the orbit spheres in the stargate look different than the diamond/gems coming off the same spheres in the released app. @JuanB did the graphics get changed before release? Or, is there another setting to change the characteristics of the animated graphics? I have done the above. Maybe it’s the individual synthesizers I’m not getting. Is their a list of CCs for each synth and their common controls? Midi learn? I tried poking around in Sunriser to no avail. Is it my imagination or does the filter envelope in Aphelian sweep the Q but not the cutoff? @JuanB: I am getting a reproducible crash if I change the Notes or Notes Flow background while a scene is playing. --OBSERVE: as soon as I tap to choose a picture, Aphelian crashes. This happens both with Notes and Notes Flow.